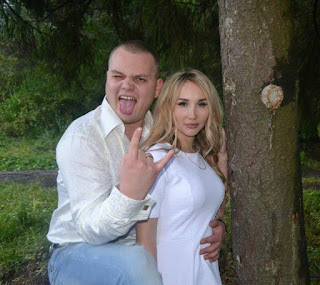 Svetlana Kostina, a 24-year-old newlywed woman has escaped kidnapping after her jealous ex knifed her new husband to death and then drove off with her - to build a new life together. According to The Sun UK, the young woman and her new hubby Dmitry Vladimirov, 26, were preparing to go away on honeymoon when her ex turned up at their home in Kirov, northwest Russia. As Dmitry answered the door, the jilted attacker, who has not been named, plunged a knife into his stomach, stabbing him repeatedly until he collapsed in a pool of blood. He then dragged the horrified blonde out of the bedroom where she had been hiding and forced her into his car, telling her he planned on building a new future with her. According to police, she played along until they stopped at a petrol station where she managed to escape and raise the alarm. The crazed wannabe kidnapper was captured shortly afterwards. When cops arrived at the newlyweds’ home they found the husband dead. A police report said: “The suspect was planning to run away to another region. “He was planning to live with Svetlana and have children with her. Distraught Svetlana later took to social media where she poured out her grief. The ex husband is now facing life behind bars.